Victoria Chai was born in Maryland. Currently a student of Ms Vivian Kwok (Seasharp Music Studio Director, Rockville, MD), she developed an interest for the piano at age six and first performed in Mayor Phyllis Marcuccio's 2nd Inauguration in Rockville. Victoria won MCMTA Recital Honors in 2012. She has performed in Carnegie Hall twice as a Grand Prix Winner in 2012 and 2013. And in 2015, Victoria won second place in the Maryland State Piano Solo Festival, third place in the Young Musicians Inspiring Change Competition, and second place in the Asian American Music Society piano competition. Locally, Victoria has played each year in the Lunar New Year Celebration at Lakeforest Mall and in The Russian Festival at Strathmore Mansion. Victoria performs at the Shady Grove Adventist Hospital and in various Senior Retirement Centers. She also accompanies her school chorus during their annual spring and winter concerts. Piano has not only become a focal point in her life, but it has also become a way for her to help others. At senior retirement centers, she plays piano for the elderly, providing them with beautiful music that helps to restore memory. In hospitals, she plays in the lobby so the music can nurture sick patients back to health. Oscar Paz-Suaznabar, a fifth grader at The Langley School in McLean, Virginia, has shown a great interest in music since the age of three, playing songs by ear at the keyboard, whether it be children's folk songs or Für Elise. His piano training began at age five, and after only five months he gave his concert debut at the Strathmore Mansion in Bethesda, Maryland, performing Franz Liszt's Consolation No. 3. By age six, Oscar had performed at the Austrian, Swiss, Russian and French Embassies in Washington D.C., the Hungarian Embassy in New York, the National Institute of Health Hospital, the John Hopkins Hospital, and Cambridge and Oxford Universities in London, UK. He has since continued an active performance schedule that included the Embassy of Bolivia, the Organization of American states in Washington D.C., the Kennedy Center Millennium Stage, the LSF (Latino Student Fund) at Sidwell Friends School in Washington D.C., the Belmont Mansion, Fairfax Town Hall and the Sherwood Center. In 2012 Oscar won the attention of prestigious Dr. Marjorie Lee and continues taking piano lessons under her direction. Oscar Paz-Suaznabar was recently selected as a Jack Kent Cooke $10,000 Young Artist Scholarship Recipient. This great honor has inspired Oscar to continue his community performing outreach, which features upcoming performances on From the Top, a live show taping at Lisner Auditorium one day before his 9th birthday, a young Soloist recital at the Concerts at the Alden series, and a Young Artist musicale at the George Mason University Center for the Performing Arts. Oscar has been fortunate to participate in the many events sponsored by the Washington metropolitan music teachers organizations, and has been recognized with many awards such as first place in the Northern Virginia music teachers Piano Achievement Awards for grades six and younger, the Washington Music Teachers Viola Hartman Achievement Awards, the Asian American Society's Peewee Division, the Washington Music teachers Association's Bartok Competition level one and two, the Maryland State Music Teachers Piano Solo Spring Competition, The Northern Virginia Music Teachers Robert Spencer Piano Concerto Competition, winner in the Kaufman Music Center International Youth Piano Competition in New York 2015, and the Grand Prix winner at the VII Chopin International Piano Competition 2016 in Connecticut. He has also appeared on interviews on the NPR radio show "All things Considered" and BBC World Service news day radio show. Offstage, Oscar is like any other fifth grader whose interests include playing with his friends, swimming with his team, drawing and writing short stories and comics. He is an avid reader of the Thirteenth Reality series, and one of his favorites authors is Garry Paulsen. He also likes science and space books. ​​Raelyn Hoang, 11, is a 5th grader at Buffalo Trail Elementary School in Loudoun County. She has been playing piano for six years and is a student of Silva Blazquez. Raelyn has competed in numerous competitions sponsored by Northern Virginia Music Teachers Association (NVMTA) and Washington Music Teachers Association (WMTA) and has won many awards. 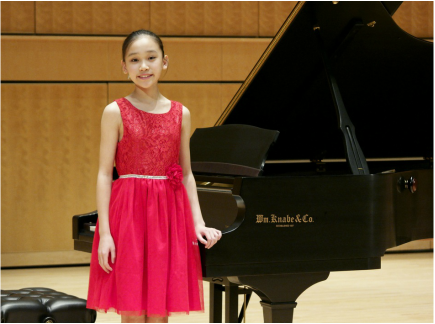 In addition, Raelyn was a first prize winner of the 27th and 28th Annual Harold Protsman Classical Period Piano Competition, second prize winner of the Asian American Music Society Competition, and third prize winner of the VII Chopin International Piano Competition. Raelyn loves to perform in public, and she has performed at the Weil Recital Hall at Carnegie Hall in New York, Young Artist Musciale at the Center of the Performing Arts at George Mason University, and at many Honors Recitals she has earned a place in from the NVMTA and WMTA competitions. Recently, Raelyn was selected as a young soloist at the Alden Auditions and will be performing next year at the Alden Theater in McClean, VA. Piano has impacted Raelyn's life in many positive ways. It allows her to express her thoughts and feelings through music. It also allows her to share her musical interpretations of many different composers with her family, friends and others. Through music, Raelyn has developed self-confidence, responsibility, determination, and time management. William Graf, 11, is an Honors Student in the prestigious Honors Program at Levine Music. He has been featured as a soloist and chamber musician at the Decatur House for the White House Historical Association Open House, and at the Verbier Festival in Miniature at the Swiss Ambassador's Request. William has had the distinct privilege of performing both as a soloist and chamber musician at Royal Netherlands Embassy, Kosciuszko Foundation, and the Embassy of France. He won first place in the Marlin-Engel Piano Competition for both the Junior and Intermediate Divisions. 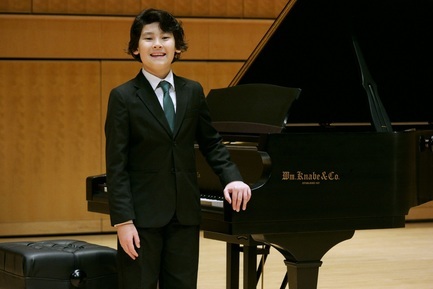 Recently, William won second place in the Senior Division of the Marlin-Engel Piano Competition, and the American Protégé International Piano and Strings Competition. He will perform at Weill Recital Hall at Carnegie Hall in New York this May. For the community, William has performed at the Cherrydale Rehabilitation Center in Arlington, Virginia; Children's National Medical Center; and he is a frequent visiting pianist for the First Music/ECEM program at Levine Music. Music is an integral part of William's life. He has learned to prioritize his many interests in order to achieve his goals. William also plays ice hockey year round, and is an oboist at his school Band. I can still remember my first piano recital. My simple song was neither impressive nor played particularly well. However, even from my humble beginnings at 5 years old, I loved the way I could express my heart through music. My musical journey since then has helped me to learn so much more about myself and grow more intimate with music. Through practicing faithfully (and sometimes not as faithfully), I have truly learned the importance of discipline and hard work. Even more crucially, I have learned that music does not come from notes on a page. It comes from the heart and life of the musician. One day, I dream to write my own music that expresses a message of hope and love to others. And I must live a beautiful life, for such a message cannot be delivered without having lived in such a way. Bentham has been studying piano since the age of five for 5 years. He is currently a student of Svetlana Volkova. Piano is his favorite hobby, He enjoys playing piano to his family and friends.